We envision our Campus for Compassionate Living in Israel as a living embodiment of the Jewish values of empathy, responsibility, and tikkun olam (repairing the world), and of the mandate not to cause tsa'ar ba'alei hayim (the suffering of animals). The Campus will include a Horse and Donkey Sanctuary and also a Humane Education Center. The Humane Education Center will be a place of serenity and beauty, in harmony with surrounding nature. It will be a center for learning, especially about horses and donkeys in Israel, but also about humane and environmental issues in general, including critical thinking and conflict resolution. The family of a young woman from California has pledged funds toward the construction of the Center in her honor and to reflect her spirit and values. The Center will be the site of seminars for teachers and children, lectures, and special events. Values taught at the Center will be reflected in activities carried out throughout the Campus, including the Horse and Donkey Sanctuary. There will be sufficient land to permit nature exploration activities, adjacent to a peaceful, outdoor area, where people can sit, rest, and contemplate nature. A building with an office and reception area, a cafeteria, and sleeping quarters for teachers or children who attend weekend education seminars, or children who attend a brief summer camp. A vegetable and herb garden, irrigated in whole or part by recycled water from the kitchen, and a compost area. A place for interactive learning activities where children can touch and play with everything and make all the noise they like. This could be a room within the Education Center, or an outdoor area. Humane and environmental education seminars for teachers. Humane and environmental education summer camp for children from abroad as well as from Israel. Resumption of CHAI's "Living Together" program, which brings Jewish and Arab children together to learn about and participate in projects to help animals. Bringing abused children together with abused animals for mutual healing, by partnering with an Israeli organization that helps abused children. Children who have been abused find it difficult to trust adults, but will readily open up to animals, especially abused animals. Forming bonds with animals becomes an important first step in healing. 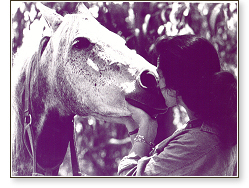 Outreach programs: teaching Arab youth values of empathy and respect for animals and proper care of their own horses and donkeys; training programs in proper care of these animals in kibbutzim and youth villages; classes for municipal workers, not only in proper care, but also in how to recognize abuse, and how to take legal action when they see abuse. Our society suffers from the effects of a lack of balance that is reflected in the dominance of one group over another — the physically strong over the physically weak, rich over poor, adults over children, humans over animals and nature, and especially in poor countries, men over women. Time and again, it has been shown that such imbalances result in disrespect, lack of empathy, and abuse of one group toward another, eventually leading to a deteriorated quality of life for both, and damage to the very fabric of society. We want people to have the feeling, when they enter the Campus for Compassionate Living, that they are entering a place where we have achieved a balanced, safe relationship between humans, animals, and nature; a place where we have, in a very practical way, made the ideal real.